The following is a guest posts by Karen Starich, who uses astrology to forecast events in the markets. I believe her unique insights will provide an alternative view to the markets, in particular the precious metals sector, as her field of study is quite specialized and she has been historically accurate with her predictions that are documented on the Motley Fool. A yank on the the dollar and the wealth of the nation. In September of 2010, I wrote an article about currencies in what I termed a “currency crisis” that would be very debilitating for the country. What is important about this article is that Saturn was transiting at 10 degrees Libra and has returned back to that same position and will sit there stationary beginning in May for 2 months. Saturn’s orbit is approximately 29+ years bringing the last pass in Libra to the 1980’s. In the 80’s we saw the S&L crises where the Fed bailed out the banks at the cost of the taxpayer and a crash in the silver market. For those who remember it was truly the height of corruption as the attitudes of hoarding the metals and manipulating the public to benefit the few. This time is different because Saturn’s station at 10 degrees Libra has not happened since 1833-34, during which time Andrew Jackson was president and effectively dissolved the United States Bank, the precursor to the Federal Reserve. During the Summer of 2011 Saturn is acting like “the reaper”, or a nicer way to put it is “Father time”,who has been keeping a perfect set of books and will not give the banks a pass until there is an unraveling of the past 30 years of corruption, which included but not limited to the excessive printing of money, over-taxation, and the manipulation of the metals markets over that time period. On April 21st I wrote about the correction that was about to take place in the silver market titled “Comex update! May 2011 this is not another 1980” You can see on the chart the dates I outlined fit to the correction which I believe was an attempt to repeat the 1980 crash. It was not successful and a historical turning point has occurred on May 17th to set the stage for silver to be used as money for years to come. There are positive signs for silver, but first here is a look at likely events for the dollar and the banks during the month of June. June 12th will most likely see a big drop in the dollar and again July 1st. and remains weak through the summer. On June 15th there is a total Lunar eclipse with what is called a “Moon” wobble. This is when the Moons nodes are either square or conjoin to a full moon or eclipse. In this case the Nodes (opposite points on the ecliptic) will be conjoin the point of the eclipse. Moon wobbles bring dire effects to the public often with weather and natural disasters. For the Fed the eclipse/wobble will square the 9th house of foreign affairs. The theme for them will be obstacles regarding international monetary policy, more insubordination forcing compromises. There could be a drastic ultimatum the Fed will have to contend with and the Strauss-Kahn scandal my bend in ways that are unexpected and not favorable to the Fed. Before the end of June and particularly around June 17th there could be more revelations regarding a banking scandal involving Goldman Sachs that could force the resignation or Blankfein. Jupiter (rules silver) is in Taurus (rules gold) and has entered the 5th house of the stock market and financial speculation in the US chart. This is positive for the metals and the markets in general. Here are the dates to watch for. June 9th could be a big spike up in silver. June 12th – 22nd there could be some big spikes in silver and and it looks like there is some very rash and reckless trading. Watch out! Starting June 25th and particularly June 30th for a correction with gold and silver. July 11th looks very bullish for silver. The beginning of an uptrend that will take the metal through $50 and not look back…. In August inflation heats up, suddenly the public mood is shifting to a more bleak and frustrated outlook about the economy despite the media attempt to portray a recovery. There is a potential for another earthquake September 22, 2011. This could be preceded by thousands of dead fish washed up on the shores of California September 3rd – 6th. Followed your ruminations on Fool.com, enjoyed them. Glad you’re still writing & you’re not lost to us Fools entirely. What draws you to this site in particular to publish your work? Any tips as to what I should particularly investigate on this site? Thank you for sharing your thoughts. I think you will find resourceful information and investing ideas here at Zentrader . What brought me here is the quality and common philosophy. I suggest starting at the “start here” tab for a really good overview of Jeff’s philosophy. Jeff has a long track record and is very credible with a large following. I hope you will stop by often. A combination of tech and astro for trading?? In my opinion, there is nothing like it to make successful trades. Karen, i respect your knowledge and forecasts but i always wonder why the earth tilt (of approx 23.5deg) is not often considered by the western astrologers. Considering that will put jupiter in Aries for another 11 months (approx), any thoughts? Also, i observed several times that when Saturn turns retro/direct, the direction of X (United states steel) changes. Any thoughts on this one? I see a positive divergence in %volume oscillator and MFI for X, which is indicating a up move shortly. But hearing all the negative sentiment in market, not pretty sure whats going to happen. Hey Lioncub, I knew you’d have a few thoughts on Karen’s post. Good to hear from you. Lioncub, you are right we are crooked! Our karma to set the planet straight again. Regarding Jupiter (the king of planets) is moving out from behind the Sun since March and I think the bigger story for this big planet are the aspects it’s making in the international charts. Most likely a financial giant (Germany) will not upset the apple cart and make an effort to keep the status quo (money pouring into the markets from international sources) however clearly the banks are bleeding. Regarding steel I think you are right. Saturn direct on Sunday and today in the news is positive for price of steel. On March 19-21 and possibly a week leading up to those dates would have shown a big increase in the price if the Saturn theory is correct. Let me know if that was the case. Regarding X (steel), yes, it went up from March 22nd – 28th (give / take a day). Can we attribute it to the opposition from beneficial Juipter? I was happy when i saw X holding up yesterday when all the market was going down, that too with up-trending volume, supporting my observation. I would like to introduce (or you may already knew) you to a vedic theory which is being followed by many Indian astrologers when forecasting markets. I tried typing here, it is going too long. I will send a email to Jeff to night. (Jeff, can you please share it with her?) You may take a look at it when you have some time to see if they are valid. (In short, ruler of market/gold & silver changes every year. This year it is the Moon. Whenever moon is afflicted, markets, gold and silver should go down. Especially silver and markets (as some say that silver moves with moon)). For instance, Moon conjoined malefic saturn last friday and the market was in deep red along with silver and gold. Will send a detailed email. will need to track steel for awhile to get the pulse of it however if theory is working steel is under a lot of stress. Maybe more stress on it when Saturn moves to 11 degree libra in 2nd week July. And then a setback 3rd week of Sept and into Oct. Regarding vedic connection of silver/moon. it always amazes me (like magic) how there are coincidences like this. astronomically there is a huge significance with the moon starting 2010 since the moon was in perigee (closest to the earth in decades) Very symbollic as the moon represents the mother, nurturing, and also silver which is meant to be the peoples money for their security. You will have to stay tuned for my next article which will be on this very subject. 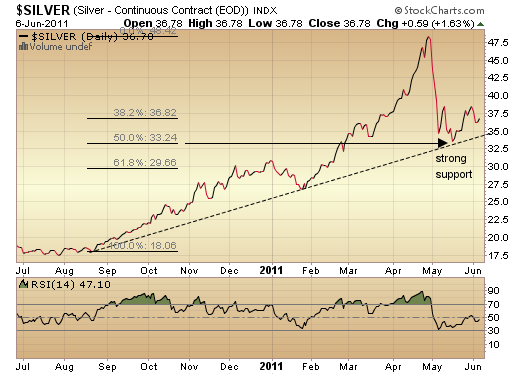 whts yur outlook on silver prices for the remaining of 2011, or at least the next 2 months?